Cars were set on fire, police were pelted with stones and civilians were beaten up as violent clashes broke out between rioters and law enforcement in the Stockholm district of Rinkeby on Monday night. 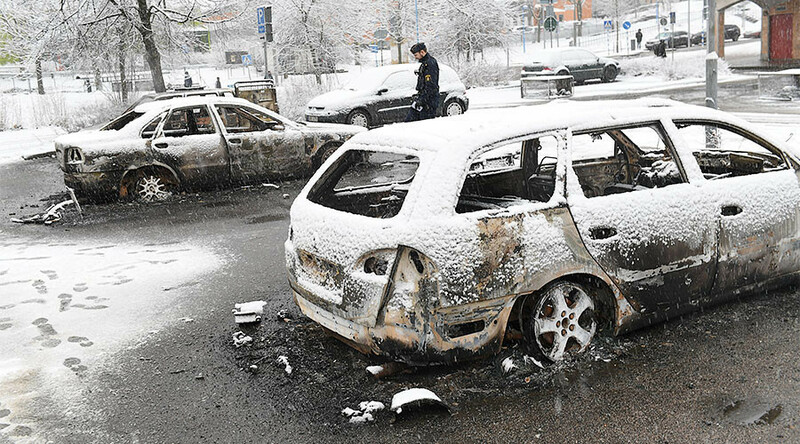 Police say seven or eight vehicles were torched in the suburb of Sweden’s capital following unrest in the area, which has a high immigrant population. It’s unclear if any immigrants were involved in the incident. The violence was reportedly instigated after police arrested a wanted person at a metro station in Rinkeby at around 8pm. Police say between 30-50 people were involved in the disturbances. Video footage from the night of destruction shows large crowds gathered and several cars engulfed in flames. Firefighters can also be seen tackling the blazing wrecks as strong winds whip flames in all directions. A police officer was injured during the fracas, forcing law enforcement to fire several warning shots, according to Swedish public service broadcaster SVT. No injuries were reported as a result of the shots. Benjamin Dousa, a Moderate politician from Rinkeby, told Expressen.se that riots and car burnings are part of everyday life in the district. “On average, we have one riot in the month, a car fire per day, and the most shootings across the country,” he claimed, before alleging that there are between 800-1000 professional criminal youth in Rinkeby and some surrounding areas. An investigation into the outbreak of violence and the attacks against the officers is underway.